Neist Point is a small peninsula, situated on the beautiful Isle of Skye - the largest of the islands in the west of Scotland. Neist Point is one of the most popular routes among visitors to the island because the ultimate goal is a view that can not be seen in many places in the world - the rocky promontory, entering into the sea, dominated by a charming lamp as a watchman guarding the wondrous nature around. Neist Point is the westernmost point on the island of Skye. Hereare found extensive and beautiful views of Moonen Bay, Waterstein Head (296 m) to the Western Isles and the place known as Minch. Here, besides the usual Scottish sheep can be seen with a little luck, plenty of seals, whales and dolphins , but the area is well known to ornithologists as an excellent place to see birds . Easiest way to Cape Neist Point can be reached by road from Dunvegan, which is the nearest town in the direction of Millovaig. Before you reach Millovaig descend by a small road marked with signs leading to parking for cars. On the way from the parking to Neist Point walk is taking down some more stairs carved into the rocks. The stairs lead to the lighthouse that dominates Cape Neist Point. This building was built in 1909 and was fully automated in 1990. The lighthouse was built by the company "Stevensons Lighthouse", and the entire project cost around £ 4, 350 at the beginning of last century. After automation, equipment parts are removed from the lamp and the tube light, located on the left front corner, is no longer in use. Lighthouse of Neist Point reaches a height of 62 feet, stands on a cliff located 142 feet above sea level. A curious fact is that light is emitted from the lamp is equal to 480, 000 candles and can be seen at a distance of more than 24 miles offshore. Today the lighthouse on Neist Point is managed and owned by the Northern Lighthouse Board. As interesting as is the lone beacon of Neist Point, it is hardly the biggest attraction here. 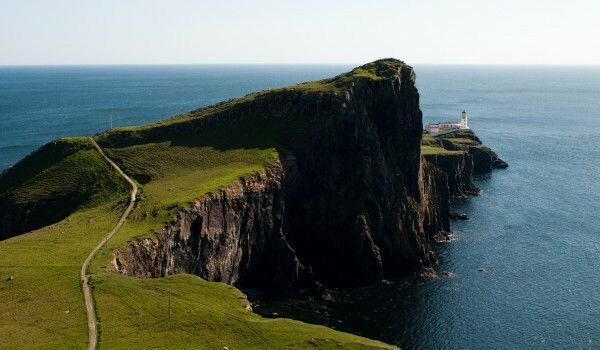 Indisputable landmark in this most westerly point on the island of Skye remains the exciting nature, animals and sea birds. Neist Point is home to several endemic and unusual plants for this area representing the alpine species. Moonen Bay to Neist Point is a good place to fish, where about 14 species of fish occur. The exciting nature of Neist Point was used as a natural scenery in the film with Emily Watson, called"Breaking The Waves" (1996).